In this C. S. Reinhart cartoon, appearing just before the Liberal Republican convention, Horace Greeley rides a pig to the host city in hopes of a nomination (either presidential or vice-presidential). 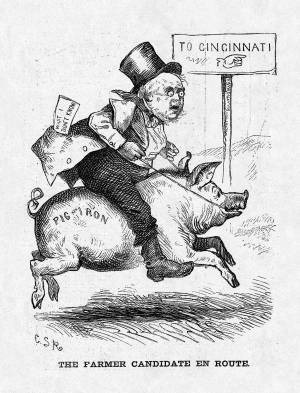 The porcine visual-metaphor blends three agrarian references: 1) to the notion of the editor as a gentleman farmer; 2) to his protectionist stance on the tariff issue-"Pig Iron" stands for American industry opposed to free trade; and 3) to Cincinnati's nickname of "Porkopolis," earned through its leading role in the slaughterhouse and meat-packing business. Like Thomas Nast, Reinhart pokes fun at Greeley's advice book, What I Know About Farming, by sticking a similarly titled paper in the candidate's back pocket. In this cartoon it is a comprehensive, negative jibe: "What I Don't Know."